These In-Wall Safes are made in the USA. No assembly required, easy installation. Uniquely designed recessed door has hidden hinge for security. Open door becomes a shelf for sorting or examination of contents. Available in 4” and 8” depth. Perma-Vault commercial wall safes are designed to fit between standard wall studs for easy installation. 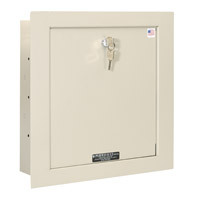 In two standard depths, the in-wall safe is a great solution for home, apartments, offices, hotels, motels, hospitals, nursing homes and dormitories. Available in standard cam lock, high security cam lock and manual push-button styles. 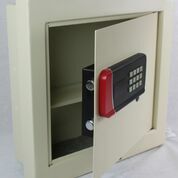 We also offer the same quality wall safes sized to your specifications. Additional locking options may be available. Contact our customer support team for more details. EW-1000-4 Standard Security lock 15-3/4″ x 15-3/4″ x 3-1/2″ 18 lbs..
EW-1000-8 Standard Security lock 15-3/4″ x 15-3/4″ x 8″ 21 lbs. WS-100-4-M UL approved Medeco High Security Lock 15-3/4″ x 15-3/4″ x 3-1/2″ 18 lbs. WS-100-8-M UL approved Medeco High Security Lock 15-3/4″ x 15-3/4″ x 8″ 21 lbs. WS-200-4 Simplex Push Button Lock 15-3/4″ x 15-3/4″ x 3-1/2″ 18 lbs. WS-200-8 Simplex Push Button Lock 15-3/4″ x 15-3/4″ x 8″ 21 lbs.